I. Individuals entering this facility must be escorted or must be authorized unescorted access by MNRC personnel. II. If you are, or suspect you may be pregnant, and would like additional information, contact the Radiation Safety Officer (RSO) at 916-614-6200.
a. RESTRICTED AREA – all areas within the fence-line. The gate is posted with a “Restricted Area” sign. There may be materials labeled with yellow and magenta with the words “Radioactive Material” and the three bladed symbol. DO NOT HANDLE THIS MATERIAL UNLESS YOUR DUTIES REQUIRE IT AND YOU HAVE BEEN AUTHORIZED TO DO SO. b. RADIATION AREA -- areas throughout this facility designated by signs with the words “Radiation Area” and the three-bladed symbol. In these areas, spend only the time necessary to complete work. c. HIGH RADIATION AREA – areas throughout this facility designated by signs with the words “High Radiation Area” and the three-bladed symbol. DO NOT ENTER THESE AREAS WITHOUT DIRECT AUTHORIZATION FROM THE HEALTH PHYSICS DEPARTMENT. EXCESSIVE RADIATION LEVELS EXIST IN THESE AREAS. IV. While in the MNRC facility, report any audible or visible alarms to the Reactor Operations or Health Physics staff. 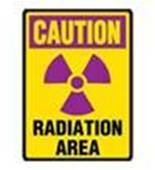 V. Any radiation areas you are likely to enter and any radioactive materials you may handle are very low level. No increase in health risks should be expected. VI. You may request a report of any radiation exposure you receive from your visit to the MNRC facility. Please fill out the following fields and click submit. Facilty personnel will contact you if any further information is needed.